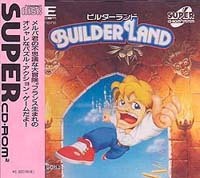 «©NCSX» Originally released on the Amiga computer by French developer Loriciel, Japanese publisher Micro World took the game and planted it on the PC-Engine as a Super CD-ROM game. Players oversee the travels of a red-haired lad by placing blocks over pitfalls and installing other stepping "stones" so that the onscreen walker can move from starting line to goal without falling to his death. Fans of Gussun Oyoyo! will find similar game play and themes. This item is also known as Builder Land: The Story of Melba. New stock in excellent condition and original factory shrinkwrap. This document is ©NCSX 1996. All rights reserved. No reproduction in whole or in part of this document may be made without express written consent of National Console Support, Inc.